What is it about fall? More than any other time of year, I crave cheese when the weather turns cold. (Look for some posts and an article in the Packet later this week that continue on the cheese theme). So when I stopped by Cherry Grove Farm the other day for some eggs (the best around! ), I couldn’t resist a wedge of their Buttercup Brie and a tub of their Fromage Blanc with Herbes de Provence. The Brie, which I first had at the September 1 Outstanding in the Field dinner at the farm, is indeed a lovely buttery yellow hue. Even at this runny stage, it is still mild. The Fromage Blanc comes in many other flavors, like garlic and peppercorn, too. 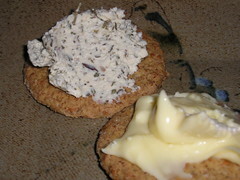 Both went well with the slightly sweet Carr’s Whole Wheat crackers I keep on hand. I’m looking forward to putting together an all-local cheese platter for holiday dinners this year! For for local, I go to Cherry Grove Farm on Rt 206 in Lawrenceville, where they make cheese from their own cows. Love their Buttercup Brie.